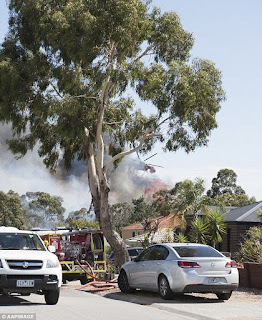 The Big Wobble: Bushfires approaching Melbourne with heatwave melting highway's in Australia bringing to a close the most incredible start to a new year ever! A heatwave has gripped parts of Australia with temperatures so strong roads and highways have begun to melt with bushfires raging out of control which has destroyed buildings and is threatening lives. According to Reuters, the heat was strong enough to melt the bitumen on a 10-km (6-mile) stretch of freeway in Victoria, national broadcaster ABC News reported. Penrith an outer suburb of Sydney had a temperature of 47 degrees celcius today, the highest ever. I know, I just read about it, yet I still get angry comments from Sydney residents saying I'm reporting fake news, I don't understand? 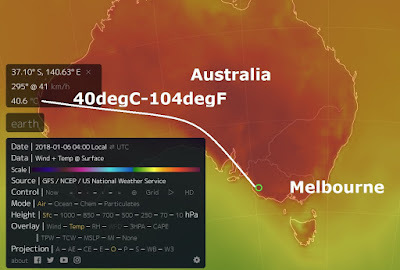 Australia is full of AGW deniers. It's the home of Rupert Murdoch and there are many Murdoch fanboys there. It's a cult of the denier.